Zimbali Ocean Villas are two luxurious holiday homes overlooking the vast Indian Ocean, set in lush vegetation and beautiful indigenous gardens. 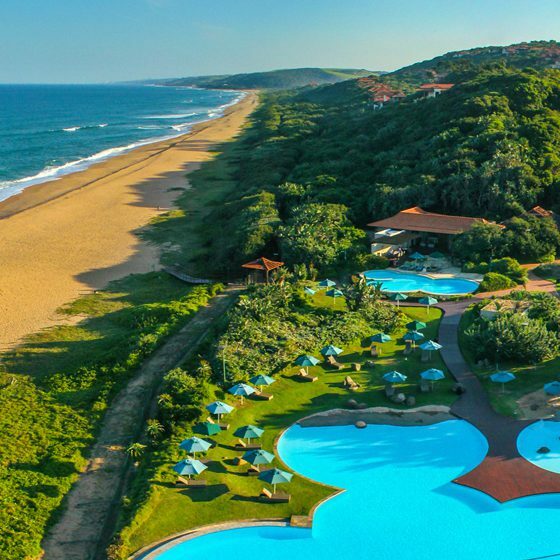 Situated in Ballito, a suburb of Durban on the golden east coast of Southern Africa, Zimbali is an ideal retreat for those looking to experience that relaxing away-from-it-all holiday feeling. The estate boasts a country club, tennis courts, squash courts, children’s pools and play areas for the little ones. Situated in a 700-hectare forest setting surrounded by a championship 18-hole golf course, Zimbali features naturally occurring lakes and wetlands. If you’re a watcher of wildlife, you’ll be excited to learn that the conservancy is home to over 220 species of bird, butterflies, insects and fauna – all thriving together to sustain a sensitive and unique ecosystem. If holiday security is something you are concerned about, rest assured that Zimbali’s security in non-invasive yet ever present. The estate is monitored by the most advanced security systems available, using a combination of surveillance technologies, and security fences and walls encompass the entire domain. Entrances are manned 24 hours a day and vehicle access is thoroughly controlled – giving you complete peace of mind while vacationing with the family. We would need five more pages to list the wonderful features Zimbali boasts for holiday makers, so get in touch with us and we’ll be happy to answer any and all of your questions!